Although it’s true that hunting with a spotlight is prohibited in many areas and for many types of high profile game, there are still a great many hunting opportunities available with predator and varmint species where the use of lights is permitted. This is particularly true in the case of raccoons and coyotes, where spotlights are a popular part of the overall gear regularly used when taking such game. While no two states or localities are the same, it’s a safe bet that there are at least a few exceptions allowing the use of spotlights in your area depending upon the type of game and time of season. The only way to be certain is to check with local authorities before making any plans, and making certain all your gear is in compliance with any regulations before even planning a nighttime hunting trip. Night hunting has been gaining in popularity primarily because the environmental conditions and hunting pressures are much less demanding and stressful than during daylight hours. Many predator and varmint species are more active at night, the temperature and humidity tends to be considerably lower, and there are generally fewer people working the same areas during the evening hours. Although hunting in darkness creates a higher degree of difficulty, this is usually a welcomed addition as no one who hunts seriously is adverse to added challenge. It’s part of what makes the hunt worthwhile and were it too easy, why bother with the effort in the first place? With an added degree of awareness and caution, night hunting is quite rewarding and can result in some of the most spectacular outings. First and foremost when considering a night hunt is of course obtaining the proper permitting and knowing the rules. Once you’ve assured yourself of night hunting's legality, you can move on to actually preparing for your nighttime outing. Since hunting at night means you’ll be losing a great deal of the information you normally receive through visual observation, safety is going to be a primary concern. Night hunting should include at least one partner, and you should have a good understanding in place that allows both of you to know the others position at all times. Likewise, night hunting is largely about stealth, so developing a way to communicate without excessive noise is also a good idea. A tap on the shoulder, a quick low whistle, gestures, and the like are good ways to make clear certain intentions and direct attention without creating undue noise that may spook wary game. Of course, no night hunt would be possible without some way to actually see what you are shooting at. This is where your choice of gear plays the largest role in determining whether you go home empty handed or loaded to your limit. Although night vision devices are becoming more popular for some species such as feral hogs, its legality is an iffy subject in many areas, not to mention the expensive nature of equipment of high enough quality for hunting purposes. The most common method of identifying targets remains spotlighting and for good reason; it’s affordable, it’s portable, and it’s effective. A good hunting spotlight does not need to be a super fancy unit that mounts directly to a firearm. Although popular with some hunters, the plain truth of the matter is that many such units hurt the balance of a good rifle, require some extra degree of skill to use effectively, and can often cause more grief than they are worth. Many rifle mounted spotlights require a power source that is too big to mount, requiring an additional battery to carry along and wires and connectors. If you think about it, do you really want to lug a 12 volt lead acid battery two miles? A good hunting spotlight will be the handheld units that produce a beam long enough to reach your preferred ranges without creating a great deal of peripheral light spillage. Popular units usually have specially designed lamp heads that recess the lamp into a housing with a leading edge that extends well past the bulb. This helps to prevent excess light spillage and create a tighter beam. Hunting spotlights also need to be lightweight and durable, with some degree of resistance to water, impacts and dropping. The last thing you want is to make it to your preferred spot and have your light out of operation because it got dropped a couple times on the way in. Likewise, to reduce the amount og gear you need to carry, it’s a good idea to choose a spotlight that is rechargeable but has the longest runtime possible. This means you’ll need to stay away from the department store plastic jobs that usually hold together and have a charge that lasts long enough to convince you to find something better. Look for LED or HID bulbs, rechargeable lithium ion batteries, and housings made of high impact materials like aluminum and nylon composites. They may cost a little more initially, but you’ll be rewarded with several seasons of reliable operation. There are several manufacturers of decent spotlights that can work for hunting purposes, so finding a unit isn’t too difficult. Some of the more popular units are of military and professional grade and can work quite well for more than just hunting, so their higher costs are offset by their added versatility. 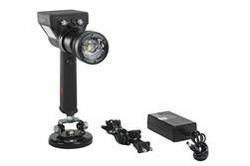 Larson Electronics offers a pistol grip LED spotlight that is quite innovative and provides a very effective light source with little weight and high durability. Considering that much of their equipment is of military and professional grade, it’s a safe bet that their hunting gear will be able to handle just about anything even the most demanding hunter can dish out. LEDs are great for hunting applications because they simply outperform almost any other form of bulb. They’re extremely durable, require little power, last for years, and in portable applications like spotlights, can greatly increase the runtime from a single recharge. Although it may have been true five years ago that an LED spotlight just didn’t have the range or power to illuminate game at any kind of distance, the units available now are good enough to make the old krypton bulb spotlights obsolete and the HID equipped units unnecessary. All it takes is a quick side by side comparison of a quality LED spotlight against a common halogen spotlight to convince even the most stubborn of those among us. Hunting at night requires a bit more planning, a lot more caution, and demands an added degree of willingness to meet bigger challenges. The extra effort required though is quickly rewarded by increased hunting opportunities and some of the most enjoyable conditions possible. Properly gearing up, choosing the right equipment and bringing along a reliable partner will almost guarantee success for the serious hunter willing to meet the challenge.